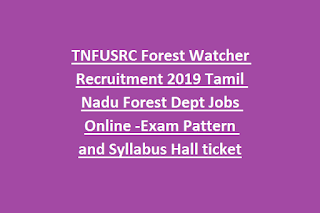 TNFUSRC Forest Watcher Recruitment Exam Syllabus 2019: Tamil Nadu Forest Dept is invites online applications from the SSLC qualified candidates for the Forest Watcher jobs. 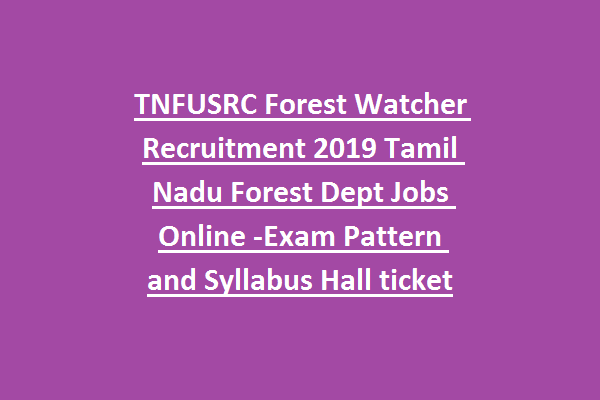 There are total 564 Forest Watcher jobs in this TN Forests recruitment 2019. 99 posts are reserved for ST Youths. Online application for this TNFUSRC Forest Watcher Recruitment will be available from 1st week of May 2019. And last date to apply online is 3rd week of May 2019. Candidates selection for this Forest Watcher jobs in TN Forests Dept is through written exam and physical tests. Height for male candidates is 163 cms and for female candidates 150 cms. Endurance tests for male candidates is 25 km walk and for Female candidates 16 km walk. TNFUSRC Forest Watcher Exam pattern and Syllabus, TNFUSRC age limits, and other details are given below. SSLC qualified candidates are eligible for this forest Watcher jobs. For general candidates age limits are 21-30 years and for reserved candidates age limits are 21-35 years. For TNFUSRC Forest Watcher posts written exam will be conducted. Those candidate who qualified written exam they are only eligible for PMT and Physical Endurance tests. Apply online for this TNFUSRC jobs through official website of https://www.forests.tn.gov.in/. Closing date of online application is May-2019.